WHAT ABOUT THE VIOLENT HEAD-BANGING? You guys may remember that I attempted this movie in-flight not too long ago, but wimped out pretty quickly, thanks to a certain early head-banging scene that I found particularly hard to stomach. Thanks to assurances from my dear friend Nelly that the movie isn’t as violent nor bloody for the rest of its run, I decided to give it another go. And, I’m relieved to report that the bloody head-banging (I’m not cursing, it really was very bloody!) doesn’t recur. In fact, once I got past that point, the rest of the movie is relatively non-violent. I emphasize that this movie’s “non-violence” really is relative, since the entire movie is about how King Yeongjo (Song Kang Ho) orders his son Crown Prince Sado (Yoo Ah In) into the Rice Chest of Doom, wherein Sado dies a tragically slow and cruel death. It’s not a bloody end, but it sure can’t be classified as peaceful, either. Even though I watched this with a pretty casual sort of lens, I couldn’t help but notice how thoughtful and intentional the directing is, in this movie. In particular, I liked the way the movie transitions between the story’s present-day timeline and its regular flashbacks. The camera typically pans away from a character’s face, only to reveal a different setting, to the same character wearing the same expression, in a different time. Occasionally, the treatment is given not to a character’s mien, but to an item. It’s all impressively consistent, and very effective. Really nicely done, I thought. Combined with the muted color palette and the careful camera angles, everything comes across as distinctly restrained, in spite of the material’s potential for drama and excess. The entire cast does a great job, and Song Kang Ho delivers an impressively subtle, layered performance as King Yeongjo. I have to admit, though, that for me, it was Yoo Ah In who stole the show. From Crown Prince Sado’s happier younger days, to his struggle to meet his father’s expectations, to his “rebellion” and ultimate death, Yoo Ah In delivers with a consistent, convincing nuance that I found thoroughly engaging and quite mesmerizing. Even during the times when I didn’t quite understand Sado’s train of thought, I felt a strong sense of sympathy for his character, and a lot of the credit goes to Yoo Ah In’s fantastic performance in the role. I really like the way the writers explore the possible hidden truths not reflected in history. I do enjoy a well-told “could’ve been” sort of story that uses what we know about history, to paint in and flesh out the possible details that could have plausibly escaped history’s pages. All we know from history is that King Yeongjo ordered his son into the rice chest and that’s how Crown Prince Sado met his end. The whys and wherefores are shrouded in mystery, and have been tackled in other movies and dramas, each offering up their version of what actually happened. In this case, I really like the thoughtful exploration of the relationship between King Yeongjo and Crown Prince Sado, as well as the peeling back of the characters’ layers, so that we get a taste of what makes them tick and what drives them forward. Despite the political context of the royal court, at its heart, this story is a very personal one, about the relationship between a father and his son; a core detail that I appreciated a lot. While watching this movie, the theme of unrealistic expectations and selfish motives leading to tragic consequences kept resonating with me. We see that Crown Prince Sado actually shows youthful, bright promise when allowed to weigh in on royal decisions, a fact which makes his father feel threatened. Which then leads to the king basically bullying his son, by casting shade on every decision that the Crown Prince makes. Eventually, the Crown Prince loses all desire to live by the palace rules because there’s simply no pleasing his father. There is literally no way out for him, because his father feels threatened by his potential and therefore by his very existence. It’s a vicious cycle: the constant nitpicking, which just makes Crown Prince feel all the more suffocated, frustrated and stuck, which prevents him from doing well, which leads to more nitpicking. With this kind of unforgiving, disdainful microscope on him, it’s no wonder he just kind of gives up along the way and starts doing what he wants to do. It made me think that anyone subject to that kind of nitpicking, where you’re damned if you do, and damned if you don’t, over an extended period, would’ve lost it. Expanding that thought to something more universal, it applies to not just parent-child relationships, but to all relationships. In a world where so many parents have unrealistically high expectations of their offspring, Sado’s story is a poignant magnification of what can happen, when a parent exerts too much pressure on a child. Beyond the realm of parents and their children, it’s a relevant theme that applies to romantic relationships, marriages, and even friendships. How many relationships do you know of, that broke down because of unrealistic expectations, paired with constant nitpicking? Personally, I can already think of a few. It seems so straightforward, and yet, it bears reminding: too much nitpicking hurts relationships, and can drive people to the brink of insanity. And the people around us end up paying the price as well. Clearly, there is no happy ending for Sado. I knew that going into the movie, so it came as no surprise to me that this story has a tragic ending. What did come as a welcome surprise, for me, was the scene where Sado’s son, the newly crowned King Jeongjo (cameo by So Ji Sub) dances in memory of his father. It’s a quiet, restrained and very poignant scene, where he dances, thinking of the joy that his father had taken at his birth, expressed in the painting, now held in his hand. It’s particularly laced with sadness, since he believes that his birth had ultimately caused his father’s death. I love how the movie presents his dance as an act in honor of his father. It’s sad that he can’t even explicitly say that he wants to honor his father, since his father did not die what the court would consider an honorable death, and has to disguise it as him playing to his heart’s content because he didn’t get to play much as a child. Given that constraint, I feel like Show did a wonderful job of presenting the dance as a way for King Jeongjo to honor his father all the same. It is clear, and meaningful, and cathartic, and so very beautiful, in the midst of the tragedy. Poignant, heartbreaking, heart-hitting stuff. More thought-provoking and personal than one might expect. Thank you, Fangurl, for the lovely review, and i am putting it next on my list! The funny thing is, I had just finished an old Dramabeans podcast (chasing Misaeng information…..I looooooooved the drama) and they talked about the Secret Door, which sounds like a 20? 50? episode sangeuk version of the same story. I would much prefer a movie to start, especially if it has Yoo Ah In. Actually, what wouldn’t be better with Yoo Ah In? PS: I agree, Misaeng is excellent!!! I am so glad you saw it! I love reading your review and loved the movie. It’s true, there is no happy ending for Sado and when his son dance to honor his dad, I feel that’s a well-deserved happy ending for him. I cried watching this scene… Well, for some reason, I cry easily on the plane XD, but this movie deserves my tears. As you said, the movie is more personal that you had expected. OMG, I cried at that last scene too! So Ji Sub with his mournful gaze is so perfect, for that role and that scene. So sad, so bittersweet, and yet, so beautiful, all at the same time. ❤ I don't know, I used to cry very little while watching dramas & movies, but I realize that in the last few years, I cry much more easily than before. Which is sort of weird, since you'd think I'd get more jaded or something, with watching so many dramas, heh. I watched recently and I cried a lot T.T (And I don’t cry so easily too). The actors, the OST, everything was amazing. But I have some doubts about the story (the real facts and the movie facts), can you help me? The subtitles I downloaded had many royal titles like daebi mama, Seja etc and they confused me a lot! Can you help me? In the beginning, when Sado was sentenced to his prison in the box, he said that he was mourning because of Jungjeon mama and daebi mama( I found out that they mean the queen and the great queen who was the woman of the former king), so… Daebi mama is Queen In Won, but who is the queen(jungjeon mama) he was talking about? Or those titles refer to the same person? Hi there Paty, I’m glad you enjoyed the movie AND this review! 🙂 Both Yoo Ah In and So Ji Sub were amazing, and I must confess I cried a little too. As for the royal titles, Daebi Mama refers to Sado’s grandmother the Queen Dowager, who died in the movie, as you would recall. Jungjeon Mama refers to the current queen, wife of the current king. 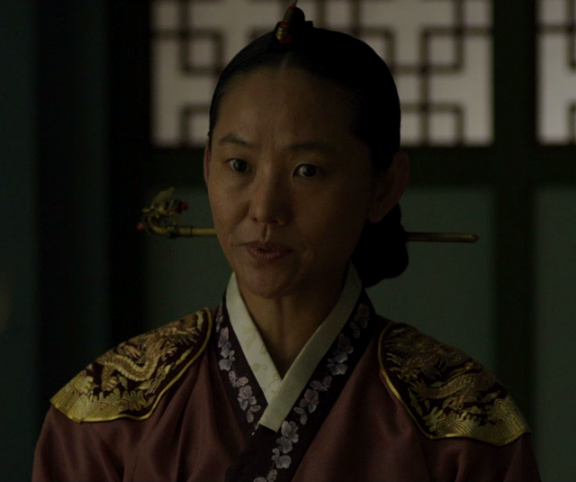 The lady character whose image you linked to, is Lee Yeongbin, one of the king’s concubines (I think!). Great review! This movie left me an ugly-cry mess. It’s so beautifully heartbreaking. That’s a great way to put it, neve.. this movie is beautifully heartbreaking, and I’m so glad I gave this a second go! Thanks for enjoying the review! Have you seen Veteran? YAI’s first baddie role, and he was so convincing I wanted to punch him in his snivelly sadistic face. Somehow he lost all his cuteness in that role, proof of excellent acting. I actually started it while on a flight, and then bailed after about 20 minutes because I just couldn’t stomach YAI’s very believable delivery of his cruel character. 😛 It’s evidence that he’s an excellent actor, but it was too much for me, lol. Haha yes if the head-banging in The Throne fazed you, then you probably should not even attempt Veteran. There was one scene with the dog that made me gasp and look away… And I’m a big fan of The Walking Dead. BTW, bit of useless trivia: YAI actually bled for real in the head-banging scene, but he continued the scene anyway. That’s what I call dedication! OMGGG HE BLED FOR REAL??? :O I can’t even imagine how much that must’ve hurt – I winced just from watching! That’s wayyy too much dedication, if you ask me 😛 We can’t have him risk hurting his brain, after all. Right now I’m just relieved that I found out about this real-bleeding thing AFTER I watched the movie and not before. If I’d known that was him bleeding for real, I might’ve never been able to get past it! BTW I think YAI and So Ji Sub should play brothers in a movie or drama… They look so alike in The Throne!